Vineyards in Southern Monterey County. The new oil-and-gas boom that’s sweeping the country may be coming to California. With it comes the controversy over the drilling technique known as hydraulic fracturing – or fracking. Widespread fracking in other states has launched a national debate over the impacts on public health and the environment. California has long been an oil-producing state, but it’s getting renewed attention because of the Monterey Shale, the country’s largest shale oil resource. It stretches under a large part of Central California. In places like Southern Monterey County, where new oil leases are being offered, the battle for fracking is heating up. 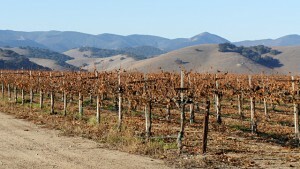 Vineyards and farms stretch for 40 miles along the narrow valley around Highway 101, about two hours south of San Jose. “As a coastal growing region, we are the largest planted acreage of Chardonnay, so much more than Napa or Sonoma has,” says Kurt Gollnick of Scheid Vineyards, a winery in the foothills of Salinas Valley. What Monterey County wineries lack is the name recognition that Napa has – and the visitors that follow. “This is something that we’re trying to change now. We do have very scenic areas of Monterey County,” Gollnick says. Lately, the focus has shifted to what’s under the ground: oil – and plenty of it. On December 12th, the federal Bureau of Land Management is opening 18,000 acres for oil leases in Monterey, Fresno and San Benito Counties. Some parcels aren’t far from Scheid Vineyards. Copyright ©, Pittsburgh Post-Gazette, 2012, all rights reserved. Reprinted with permission. “This is where that whole conversation of fracking comes up,” Gollnick says. 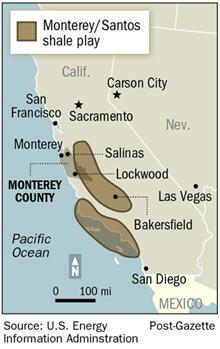 The oil deep in the Monterey Shale is notoriously tough to extract. Most if it is locked inside the shale rock. 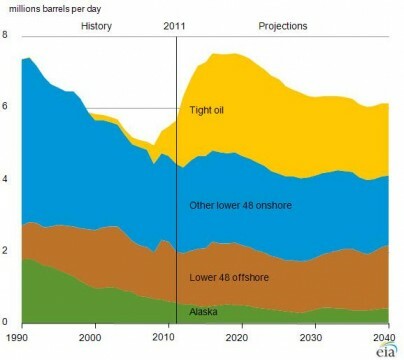 But recently, oil companies have gotten a lot better at getting oil out of shale thanks to hydraulic fracturing. Millions of gallons of water, mixed with sand and chemicals, are injected underground at high pressure. That cracks the rocks, letting the oil out. Around the country, hydraulic fracturing has led to record levels of oil and gas production. “Right now there’s a bit of a Gold Rush mentality concerning shale oil,” says Don Gautier, a geologist with the U.S. Geological Survey. He says fracking is nothing new in California. It’s been used for decades. “What is new right now is that the price of oil is reasonably high. This technology has become very sophisticated. So these explorationists are justifiably optimistic about the idea of being able to get out oil that couldn’t have been accessed just a few decades ago,” Gautier says. California’s oil shale resource is huge – more than 15 billion barrels in the Monterey formation, according to one estimate. It’s bigger than North Dakota’s oil reserve, where recently, thousands of wells have been drilled. That has a lot of people wondering – is California next? “There is absolutely a danger of California being transformed almost overnight as other areas of the country have been when the fracking boom hits,” says Kassie Siegel, a lawyer with the non-profit Center for Biological Diversity. Whether those impacts are specifically caused by fracking is under debate in many places, but Siegel says it’s enough to be concerned. Her group is suing the Bureau of Land Management over the oil lease sales, saying the agency has failed to review the risks that new fracking techniques pose. “They are acting as if nothing has changed in the oil and gas industry, but of course everything has changed,” Siegel says. At the Bureau of Land Management office in Hollister, manager Rick Cooper says they’re offering the oil lease sale because of interest from oil companies. “Any time there’s new technology, then there’s going to be maybe a little buzz and a little interest in areas that hadn’t previously been developed,” he says. The agency is predicting minor environmental impacts, however, because their analysis doesn’t forecast much new drilling. “We haven’t seen development signals as of yet. But if we begin to see increased development, it would be at that time that we would pull back and say, well, we probably are going to have to do more analysis,” he says. Several oil companies, including Venoco and Occidental, have reported they are experimenting in California’s shale formations. “Certainly our members are exploring how effective hydraulic fracturing is going to be in California,” says Tupper Hull of the Western States Petroleum Association, an industry group representing oil and gas companies. Hull says California’s geology could be challenging for large-scale fracking. The shale layers are messy, bent by seismic forces. But he believes fracking has the potential to boost the state’s oil production, which has been declining for two decades. “If hydraulic fracturing proves to be successful here as it’s been elsewhere, it’s an extraordinarily optimistic future we’re looking at from an energy point of view,” Hull says. Interesting that no mention is made of the correlation between hydraulic fracturing and increased seismicity. Given that California has a large amount of natural seismic activity, it seems the risks of hydraulic fracturing extend beyond the valid concerns of ground water contamination. No mention was made because there is no correlation. You’re probably thinking of wastewater injection wells, which have triggered a handful of small earthquakes in the Midwest. I’ve covered fracking issues here and here on KQED Quest Science Blogs. Actually there have been many studies done on this subject. all of them have found that while it is possible to detect some micro seismic activity in fracking locals, there have been no evidence that true earthquakes can be triggered by fracking. This has been another scare tactic used by the anti fracking activists to influence people with misinformation. Please cite one of these studies for us. It is extremely unlikely because the rocks at the depths where fracking takes places are not under the kind of stress related to earthquakes. There have been no legitimate issues with fracking and groundwater contamination. Farmers on the other hand have contaminated most of Monterey County’s groundwater and continue to do so. Efforts have begun to clean up that contamination but they are generally opposed by farming interests. There is no correlation of seismic activity because even though there has been monitoring there is nothing to report. Areas with contaminated groundwater were investigated as to whether nearby fracking had any effect. In all cases the groundwater had been documented to have been contaminated long before any fracking began. There are many areas in California where well water is naturally contaminated with hydrocarbons. This is nothing new or is only news to those who have not made an effort to learn. “In January 2011, the first peer-reviewed report suggesting a link between fracking and illness in animals was published by Michelle Bamberger, an Ithaca, N.Y., veterinarian, and Robert Oswald, a professor of molecular medicine at Cornell’s College of Veterinary Medicine. “Within the 24 case studies of farms in six states exposed to oil and gas drilling, the authors present 27 pages of preliminary evidence that suggest that contamination of water, air and soil released in drilling activities impacts animal and public health. “One particular case study from the report echoes the Hunts’ own empirical evidence. Over a three-month period, 96 cattle grazing in three separate pastures were observed. Of the 60 cows that had access to a creek contaminated by the illegal dumping of wastewater, 21 died, 16 failed to reproduce and several had still-born calves. The remaining two pastures were at higher elevations and away from the creek, and of the 36 cows grazing there, none experienced adverse health effects or death. “The greatest fear is that exposed animals are making their way into meat and dairy products for human consumption. Animals that die are often ground and fed to chickens or pigs. Perhaps the most important conclusion of the study suggests that animals exhibiting these health problems could be indicative of a future emergence of public health problems. Of course, contamination of surface water is an important concern. That is a result of sloppy and poorly regulated practices. mistakes are a part of life…so if fracking is allowed…image all the “mistakes” that are going to be made….imagine the impact of each mistake…how will this all add up? “Earthquakes triggered by fluids injected deep underground, such as during the controversial practice of fracking, may be more common than previously thought, a new study suggests. “Fluid injections into Earth are not uncommon. For instance, in hydraulic fracturing, or fracking, water, sand and other materials are injected under high pressure into a well to fracture rock, opening fissures that help natural gas flow out more freely. Fluid-injection operations are also used to help get power fromgeothermal energy, and to dispose of waste. If you read the story and its links, you will not see any reference to fracking triggering earthquakes. That’s exactly what I said to the previous commenter. I can’t prevent writers from getting things wrong, but I can point it out so you won’t get it wrong too. People are downright eager to blame earthquakes on fracking, but there is no link. The reason is that fracking takes places at depths that are too shallow to sustain seismic stresses. Hydraulic fracturing causes induced seismicity called microseismic events or microearthquakes. The magnitude of these events is usually too small to be detected at the surface, although the biggest micro-earthquakes may have the magnitude of about -1.6 (Mw). The injection of waste water from gas operations, including from hydraulic fracturing, into saltwater disposal wells may cause bigger low-magnitude tremors, being registered up to 3.3 (Mw). Please note carefully the difference between hydraulic fracturing operations and deep injection wells. The first paragraph makes that distinction. Incidentally, earthquake magnitudes of minus-one and minus-two have about as much energy as a car crash. The second paragraph does too. The third paragraph mentions “fluid injection during hydraulic fracturing,” which again refers to deep injection wells. The same with the last paragraph. Four times zero still equals zero. Fracking serves to RELIEVE future seismic activity, even in a worst case scenario. Please — that is not true. Conservation and efficiency count for more than “go get more.” California is abundant in renewable & sustainable energy: solar, wind, geothermal, hydro. You pick the low hanging fruit first, not the more expensive, short-term and destructive fracking energy. So the “low-hanging fruit” powers YOUR lifestyle? I think not….you’re partaking of the high-hanging fruit as we speak, because it’s cheaper. “Whether those impacts are specifically caused by fracking is under debate in many places.” Please. Benzene, toulene, methane, ethylene dichloride. Farm animals sickened and dying. Talk to the farmers in North Dakota and Pennsylvania. Welcome to our future. So that we can burn more hydrocarbons, increase global warming, but benefit from lower gas prices. No thanks. Like New York, we need a moratorium on fracking. Is there something untrue in that sentence, or are you just here to assert your own sense of certainty? I agree that we need to stop burning carbon as soon as possible. We need good science at every stage, including this stage, to verify that we’re accomplishing what we want to accomplish and not wasting effort on unrelated things. These are all unsubstatiated stories or isolated instances, again used by the antifrackers to scare partially informed people. The truth is that fracking can and is done safely and is producing oil and gas that this country desperately needs. ..just came back from North Dakota. The farmers are happy. There is no substantiated groundwater contamination from fracking. In oil drilling, there are occasional issues with casings and cementing around casings–nothing new, as old as the industry itself. These issues are dealt with on a case by case basis, and no acquifer or other water supply has permanent damage from such accidents. Unless, of course, it’s in a country w/little or no oversight, and where they just don’t give a damn–countries where there isn’t much indoor plumbing, for instance. One sure thing is that the Perfect Worlders will play fast and loose with the truth, and use ANY problem with casing/cementing/spills to obfuscate and confuse the issue(s) to whip up sentiment against the oil industry. All the while, their retirement fund(s) are invested in, and making good returns from—–the oil industry. Go figure. Definitely should be explored further production and do it the safest way. I think it promotes economic activity in place but you have to agree on the conditions. There HAS been a correlation of fracking and seismic activity. A UK drilling firm said last year that a series of small earthquakes was probably due to it’s fracking activities. Gauthier is incorrect in failing to mention that horizontal hydrfracking is new (as opposed to vertical) -suely he knows this. Is this a biased “expert”? Horizontal versus vertical is unimportant for what Gautier was talking about. The basic technology is exactly the same. The innovation underlying the gas rush is directional drilling, which is not a new technology either.